10mm beads are the most requested size used in our handmade bead bracelets. Why? We wonder the same thing, but it seems that customers prefer this size bead more than 6mm, 8mm, or 12mm when selecting their bracelets. 10mm beads are just the right size for making a bold statement that is also quite tasteful. Their weight is just heavy enough to command your attention, but not so heavy that they weigh your wrists down throughout the day. These bracelets are very stylish when worn alone, stacked with others bracelets of various sizes and materials, or paired with a watch. If you are selecting your first BOYBEADS bracelet, I believe a 10mm bead size would be a great start to your collection. Since 2011 BOYBEADS has continually strived to conceive staple bracelets that encourage the modern man to fully exercise his intrinsic right to willfully own and curate his unique fashion identity. Each bracelet has a name and character representative of the man it is designed for. BOYBEADS bracelets are meticulously handcrafted in New York with semi-precious stones showcasing the naturally-developed patterns indicative of the environment in which each stone formed over thousands of years. 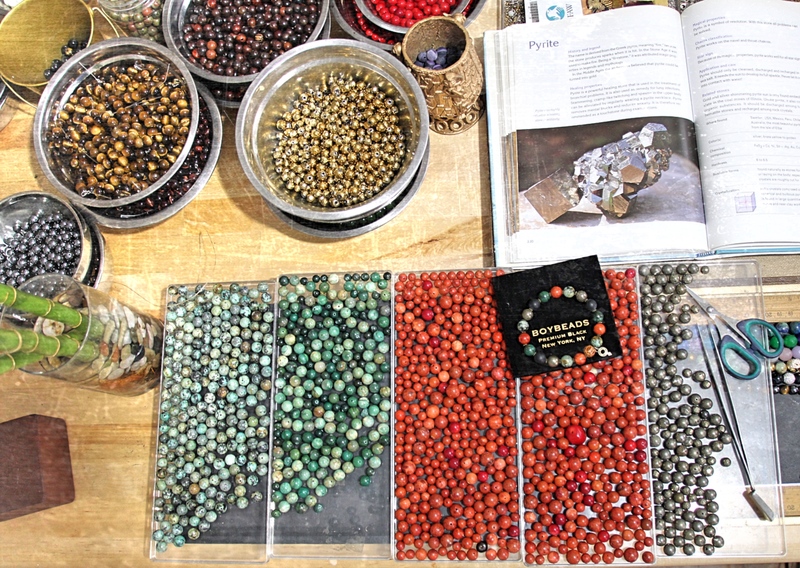 BOYBEADS are made to order in our New York studio for each customer. There is no pre-assembled stock. When you place your order, we begin making them just for you as quickly as possible. Completion of your custom bracelet(s) and shipment usually takes 1-2 business days from the receipt of your order. However, we ask that you please exercise patience as orders may take 3-4 business days to ship during the peak seasons. Our bead bracelets are made in New York with natural stones from the Earth and top strength stretch string from Germany. It is imperative that you know the wrist size of the recipient in order to select the proper bracelet size. We recommend a bracelet of 3/4 inch (snug fit) - 1 inch (loose fit) larger than your wrist size. For example, if your wrist measures 7.5", you should order a bracelet of 8.5" for a loose fit or 8.25" for a sung fit. If a customer returns a bracelet for resizing, we cannot simply add or remove a bead- the entire bracelet must be cut and made again. Completing this process requires up to two hours per bracelet. We recommend that you measure your wrist with a tape measure before ordering your BOYBEADS. Read more about sizing here.